But this is not a story about a cupcake. This is a story about two halves of a cupcake. According to Greek mythology, humans were originally created with 4 arms, 4 legs, and a head with 2 faces. Fearing their power, Zeus split them into two separate parts, condemning them to spend their lives in search of their other halves. It's a terribly lovely idea, and I like to also think about it beyond romantic relationships. Sometimes you meet someone and you bond so closely, on such deep levels, that it doesn't seem illogical that you were possibly once the same being. Not having a strong offline support system in California is one of the reasons why I've struggled so much out here. These things take time to develop, I know, but even without the stress of being the new kid in a new place, I've always had a tough time making new friends. I'm shy, I'm initially rather quiet, and I'm harboring stories that I've always found myself apprehensive about sharing with people. It's particularly tough, too, that I met some really fantastic people and finally started to feel like my Chicago social circle was expanding about a month before I was uprooted with no warning. One of whom was Claire. When we met last summer at the Do Life 5K on the 4th of July, there were two forces of destiny at work. One, that we would meet that day and become incredibly supportive and fantastic friends. And two, that our time in the same city was limited - I applied for my job in California the day before the run. For one reason or another, I haven't seen Claire since the Bastille Day race, so a reunion was absolute top priority this time around. First, because I missed her intensely. Second, because there were a lot of stories ready to explode out of me, things I have kept off the blog for a number of reasons. And third, somewhat selfishly, because I wanted a babysitter, of sorts. I wanted to make sure I didn't fall into the issues of my last visits, and I knew that spending time with someone who understands and inspires me would help me make sure that at least one day could be counted as a victory in my recent binge struggles. I've had a really tough time with binge eating on my visits back to Chicago. I see the people I love and visit the places I used to frequent, and I wish that was enough to keep me feeling satisfied. But feeling like a stranger while walking around a place that used to feel like home is tough, not to mention the fact that all my visits have been emotionally very heavy, as is to be expected when you infrequently see the people you care about. For me, a binge is not about the food, but the ritual. And my experience has typically been that binges are (a) usually carb-heavy and (b) always secret. Walking around unknown in Chicago, stressed and overwhelmed by whatever that visit's emotional issue was, I would seek comfort and familiarity in the ways I traditionally sought them. I promised myself that this time would be different. I would find comfort and familiarity in non-food sources. And how lucky I am to have spent one of my days with Claire, talking and laughing and crying and shopping and feeling absolutely perfect. As I've worked through my frustrations with being in California, I've been so grateful for my friends, and for the fact that the weeks or months between visits and two thousand miles between us are only time and physical space. We see one another again, and the distances are irrelevant. It feels as if we'd seen each other much more recently, and all that matters is that right now, in this moment, we're hugging each other tightly. I told her about California, about my relationships, about the binges, about my fears and frustrations with weight loss and exercising and the whole business of healthy living. And with each word rolling off my tongue, it felt like emotional weight being lifted off of me. Being able to bond with someone over shared feelings and experiences is one of the most satisfying parts of human existence. We can count ourselves lucky if we have a friend we can share our secrets and stories with, but we're even more blessed to find someone who follows them up with "me too." 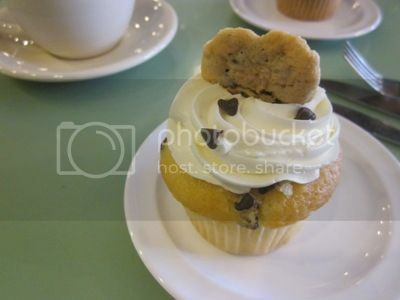 Claire and I are open (with each other and on our respective blogs) about our struggles with binge eating, and while traversing the city in search of adorable dresses for spring and summer, we found ourselves at Molly's Cupcakes. Overwhelmed with choices while looking in the glass case, we decided to each get one cupcake - and to split them in half. 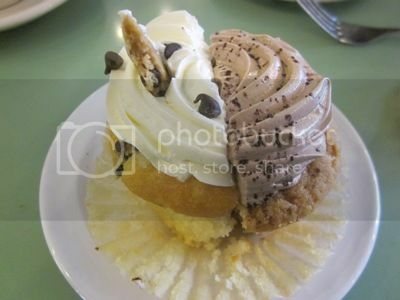 At my biggest, cutting a cupcake - or any food, really - in half never crossed my mind. I didn't need to decide between one thing or the other - I'd just have them both. (And if the choices were only two, that'd be a lucky thing in itself.) I didn't save food for later. I didn't share it. But to be honest, I didn't share much of anything. I didn't share my stories, my secrets, my thoughts. So, of all the changes that have happened with the weight loss, this is, without question, one of my favorites. I'm open with my experiences. I tell my stories. I share my concerns and my successes - and my cupcake. And I am endlessly, incredibly grateful for someone like Claire to share them all with. We haven't ever really interacted, but I think you should know that as far as health & fitness blogger couples go, you & Claire are my favorite. Next to Claire & I, of course. But I may be biased. Both of you are so incredibly inspiring, and this community of bloggers is lucky to have you as positive examples for humbly welcoming successes and handling adversity with grace and honesty. Such a wonderful sentiment. I think everybody should find that person that you can openly discuss things with. Lucky you and luck claire for having you too! :D P.s those cupcakes looks amazing! Wonderful post! Thank you for sharing it. Those cupcakes look yummilicious! I'm new to your blog, I'll have to peruse your other posts. Thank goodness for friends like Claire! What a fantastic post! Claire seems like a wonderful, TRUE friend. It's great that you were able to meet her before leaving for CA. I love this post, it's brilliant. I hope one day I can find a "Claire" in my life too.